The PIBBS FM3830A comes with virtually all the features a prospective buyer might ever be looking for in the best home foot spa. For one, the model is both versatile and convenient as it features three modes: vibrate and heat; bubbles, vibrate and heat; and just bubbles. It might be worth noting that this product is specially destined for people whose shoe size does not go over 12 to 13. It’s safe to say that size has a lot to say in regards to user experience, so be sure to take this detail into account while analyzing this alternative. As for the water capacity of this model, it can hold up to four and a half inches. Unlike other products on the same line, the PIBBS FM3830A comes with all the accessories one might require. In consequence, the pack includes two dual side foot pads, three plastic insert attachments, one splash shield as well as a cord storage band. 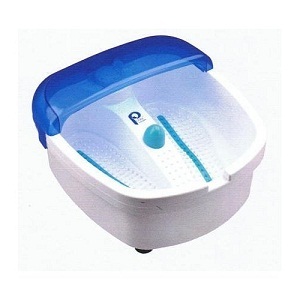 Yet another feature to consider when it comes to buying a dependable foot bath is durability. Fortunately, the PIBBS FM3830A is made with high-quality materials that make it possible for its owners to continue using it through the years. There’s practically no chance of any buyer breaking the machine since it comes with four rubber feet. These kinds of feet keep it stuck to the ground even if you plan on doing your pedicure on a slippery floor. Other characteristics that might be worth noting in regards to this foot spa is that it has an eye-looking design and is lightweight enough to be taken on the road. In addition, it’s affordable enough to avoid breaking any prospective buyer’s budget. On this account, we’ve found that the machine can be purchased for less than one hundred dollars on most online marketplaces. 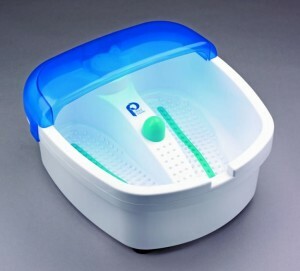 A net advantage of purchasing this unit is that users have the freedom to utilize both Epsom salts and essential oils. In case you weren’t aware of this factor, some foot soaks don’t allow owners to utilize any substances because they might lead to the unit malfunctioning. Most of the people who went through the trouble of reviewing this product make it clear that it does wonders when it comes to relaxing one’s tired feet. Individuals who spend over eight hours on their feet while they’re at work find that using the machine makes all the difference when they get back home in the evening. Ease of use is a core characteristic of this model, as it has controls that are easy to touch. What’s more, the settings of the device are relatively easy to customize and adjust according to the requirements of the person utilizing it. Even though there are over two hundred positive Amazon reviews on this product, there have been some people who have expressed various minor concerns. The majority of these complaints are related to the instructions provided by the manufacturer, but they were swiftly resolved by the users by calling customer support.